See the lights on Oct. 16-17! Later this week, the public will be able to see colored lights on Tilikum Crossing, Bridge of the People. The aesthetic lighting is part of the Portland-Milwaukie Light Rail Transit Project’s Public Art Program. 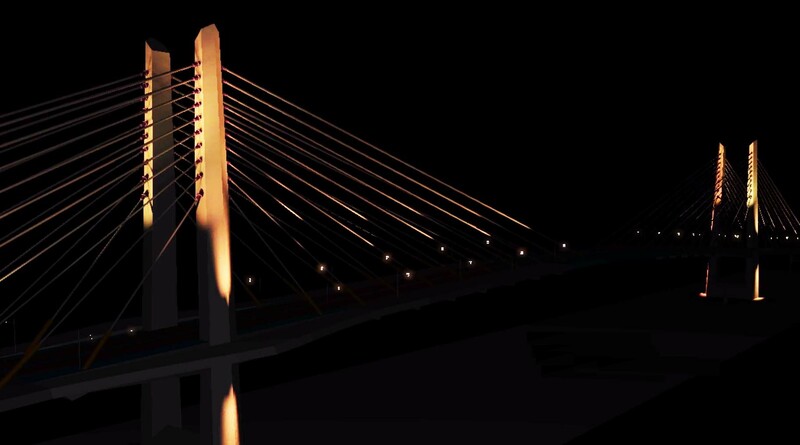 A conceptual design of the aesthetic lighting on Tilikum Crossing. The testing of the 178 LED lights will begin around 8 p.m. on Thursday and Friday nights, Oct. 16-17 with crews working overnight. When completed, the aesthetic lighting will be directed at the 20 bridge cables, the four tower pylons above and below the deck, and the two landside abutments. The lighting translates the natural conditions of the Willamette River into subtle color and motion effects. The public can view the lights from both sides of the Willamette River, with easy access at SE Caruthers Plaza on the eastbank of the river. Once the aesthetic lighting testing is complete, it will be turned off until September 2015. The lighting system will change colors according to data streamed from a U.S. Geological Service river monitor near the Morrison Bridge. The lighting effects will change based on the river’s speed, height and water temperature. Lighting programmer, Morgan Barnard designed specialized software that reads the data from the river and translates it into the movement of color and light across the bridge. The base colors will be determined by the water temperature. The speed of the river controls the pace at which the colors change and move across the bridge. The height of the river is displayed by a secondary color moving vertically up and down the pylons and cables. These river characteristics are a dynamic system, with large changes over the course of the seasons and smaller fluctuations that occur constantly throughout the day. LED lights are five times more energy efficient than conventional metal Halide lights and last up to 16 times longer with far less degradation of lighting output. In addition to the aesthetic lighting, the bridge has aviation and river transport navigational lighting, as well as functional lighting for bridge use during nighttime hours.